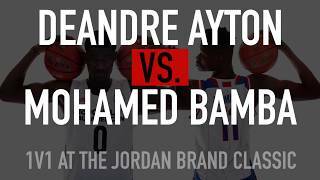 DeAndre Ayton and Mohamed Bamba go head to head in one on one post drills at the Jordan Brand Classic. DeAndre Ayton was also a last minute withdrawal, after already having committed to playing initially. Ayton did not have great showings at the BWB Global Camp or the Nike Hoop Summit last year and may prefer to wait on getting this type of NBA exposure until he arrives at Arizona in the fall. A video interview with one of the top prospects in high school basketball, DeAndre Ayton at the Under Armour Elite 24.